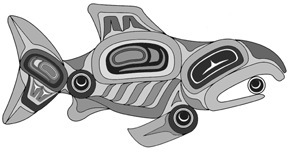 A Traditional Pacific Northwest image, repeated throughout native art. Done in salmon irridized glass with other highlighted colors and dichroic glass. 33x15x5 boxed.